Steam – It's a Monster! The Steam Monster Summer Sale, that is. Go forth and find some games! It’s possible my finger slipped and I purchased The Repopulation; I don’t know much about it but I have an old friend very much involved with it and a few other friends have said nice things and hey, new MMO with SWG and UO flavour, TAKE MY MONEY I’M IN! The spousal unit purchased the entire collection of Heroes of Might & Magic games, which I stopped caring about around number 5 (or 6, whichever one was the amazing disappointment) and got us hooked up on the family dealy so now he’s trying out games I bought on other amazing sales and have *cough* never even tried, like LA Noire. Meanwhile the SWG honeymoon continues, perhaps fanned by the fact that there’s never enough time to play it. Absence, heart, fonder, etc. I’m logged in a lot, but mostly I’m AFK sampling which doesn’t really count as playing. When I do get to play I have fun — but not in the way I expected. Crafting is entertaining, yes, but there’s very little impetus to get up and running because the server is choking on a surplus of great crafters, largely because everyone can make 10 characters so everyone can have all the crafts. I know, waaahmbulance. So I’ve been doing combat here and there – initially to pay the bills (which still strikes me as backasswards – I made a fortune as a crafter back in the day), and now because it’s rather fun even though the SWG combat system is probably one of the clunkiest ever. 2003 and all that. Yay! I used to slap at least one stormie a day with my Sword/Doc/Rebel back on Shadowfire, just because. Oh yeah, and there are working droids now too. And Bio-Engineer got an Image Design makeover by a Rodian hopped-up on Skooma or something because it’s just… weird, now. It’s being tweaked, thank goodness. 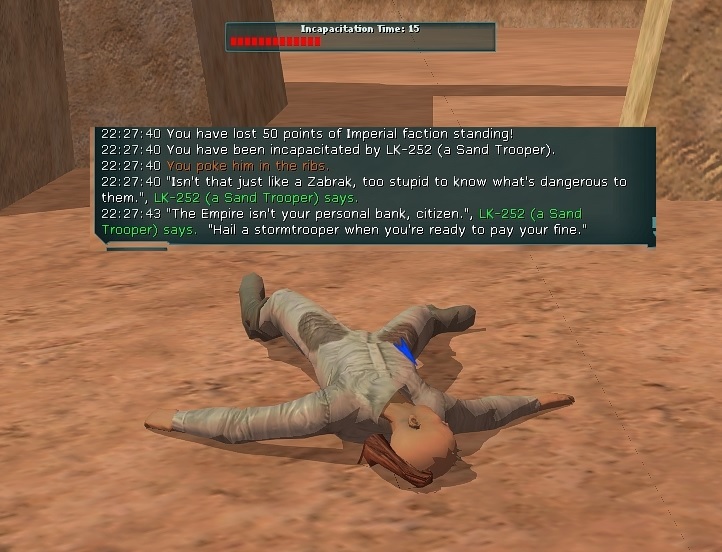 In the meantime master BEs are producing CL10 non-CH creatures with 9k HAM – which means nothing to anyone not playing SWG and should make SWG-players’ eyes bug out. That’s it. I’m off to try The Repopulation since SWGEMU-Basilisk just took a nosedive. Ah, post-patch weeks. Gotta love em! You can either get a used one on Amazon or EBay or wherever… or you could, hypothetically speaking, use slightly less kosher methods. The EMU doesn’t need anything but the base install and you never actually fire up the original SWG. Bear in mind though that it’s a very old game. I just tried the Repopulation a bit last night and it FEELS a lot like SWG, even if it looks nothing like it and doesn’t have that Star Wars cachet. It’s on the Steam sale atm.